Here is an EXTREMELY exciting video of “Tiny” the smallest chick. I just tried to keep her center frame for 2 minutes. Not my best effort so far, however, I have a BLOG back up, so I need to get some posted. 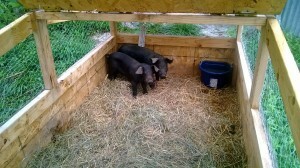 This entry was posted in Uncategorized on September 12, 2013 by Angel Garden Farm. This short video is May the pregnant jersey cow meeting T-bone and Rib-eye for the first time. She MOOed for 24 hours straight in those boys’ direction from the holding paddock, but we haven’t heard her moo once since she joined them up on the hill. Early in the video you can see she kicks up her heels and you can just tell she will fit in at AGF. We are so glad that May is with us. Our little farm is growing all the time, and we thank God for all the blessings that have come our way. We thank God for keeping the desire to continue this venture stirred up in our hearts. The natural methods we are using to raise these animals mimic nature as close as possible and we respect and treat them humanely, and thank them as well for the sacrifice they make for all of us. If anyone is interested or has any questions, please feel free to contact us, we are happy to talk about the farm, politics, religion, food, school or even the weather. This entry was posted in Uncategorized on September 3, 2013 by Angel Garden Farm.